• Suitable for persons suffering from allergies! 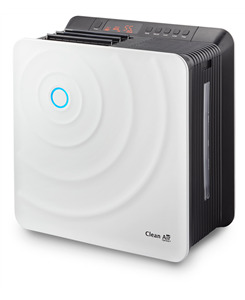 The unique air washer CA-803 does not only purify indoor air, but simultaneously emits humidified air. A fan aspires unclean and dry air which is first conducted through the activated carbon prefilter and then guided through the rotating humidification disks with scoop ribs. 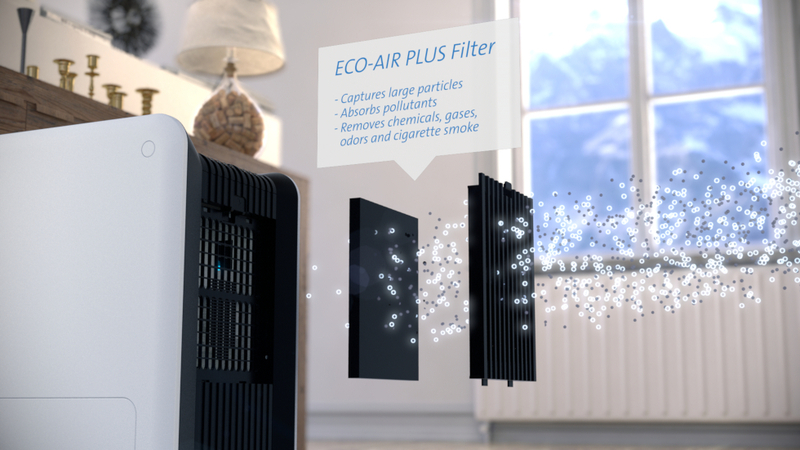 Prefiltered air is naturally washed and purified comparable to a rain shower or a waterfall. The smallest particles up to 10 micrometers are bound and separated. The system functions without filter pads and is particularly hygienic because of the antimicrobial water filter. Further attributes: digital control of air humidification, easy operation and maintenance, uncomplicated, high performance, very silent. State of the art air washing system for an optimal indoor climate! 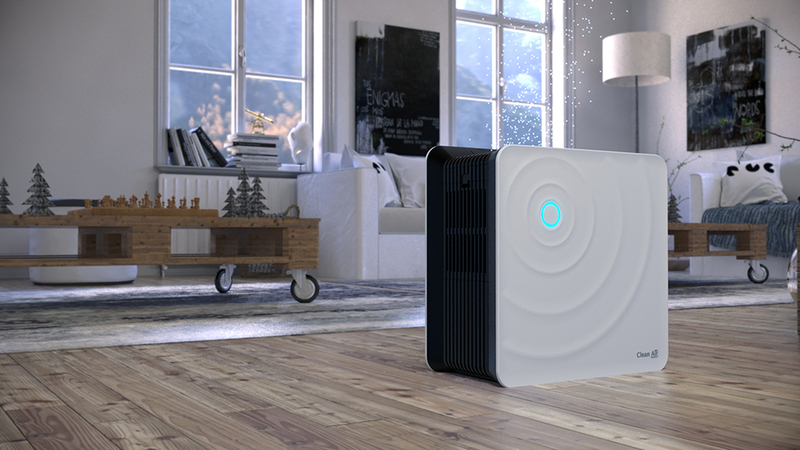 The new air washer by Clean Air Optima fulfills two functions. 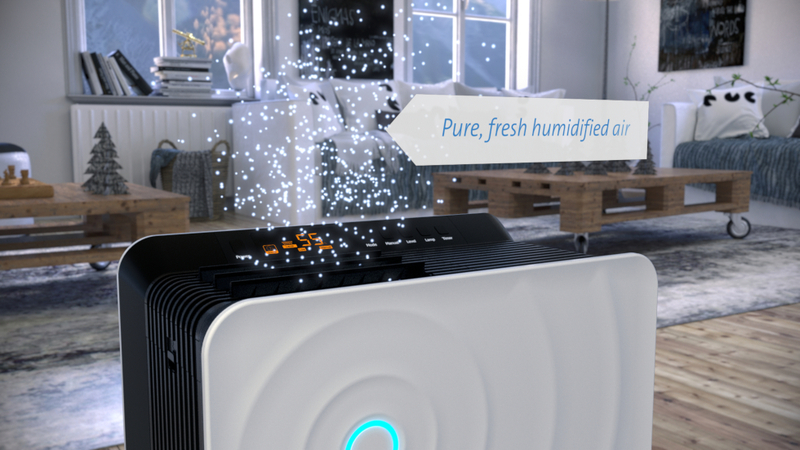 This highly effective air washing system humidifies dry indoor air and purifies it at the same time. The CA-803 is ideal for each interior, living rooms, offices, treatment rooms, medical practices etc. up to 35m² / 90m³ / 375ft². The technology of the modern Clean Air Optima air washer CA-803 belongs to the most effective methods of automatic air humidification and purification indoors and functions according to the principle of air washing without filter pads. 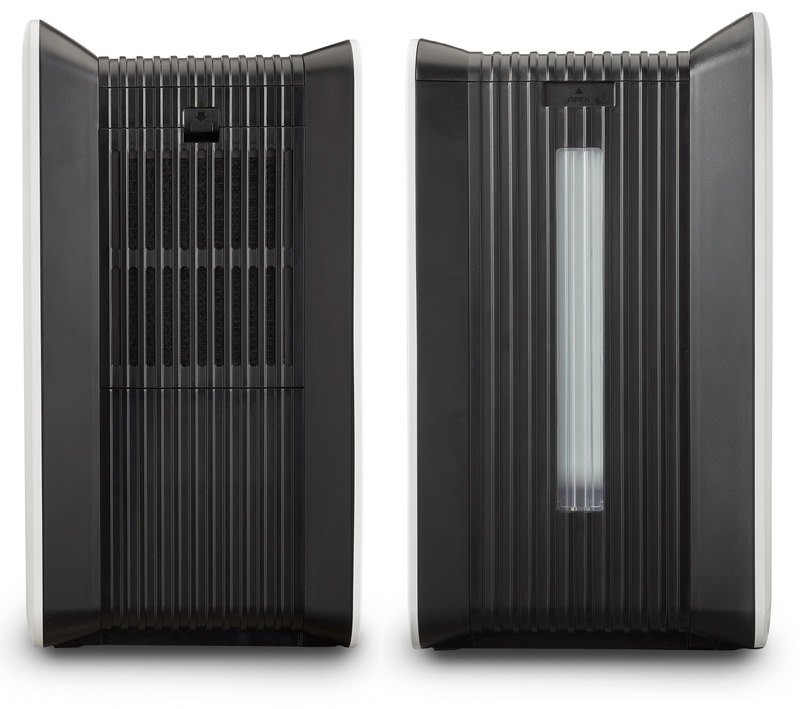 This state of the art air washer by Clean Air Optima possesses highly effective filters. The integrated activated carbon prefilter stops hair, dust and other bigger particles and absorbs bad smells. The additional nano silver water filter provides hygienic and clean mist and works against bacteria formation. 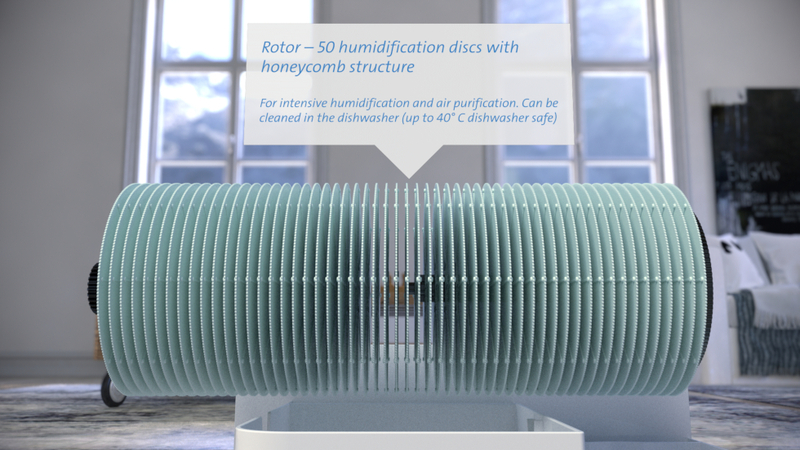 The rotor with specially structured humidification discs rotating in the water provides intensive humidification indoors. The air is enriched with humidity and water acts as natural filter liberating the air from impurities (as for example dust, pollen and smells). 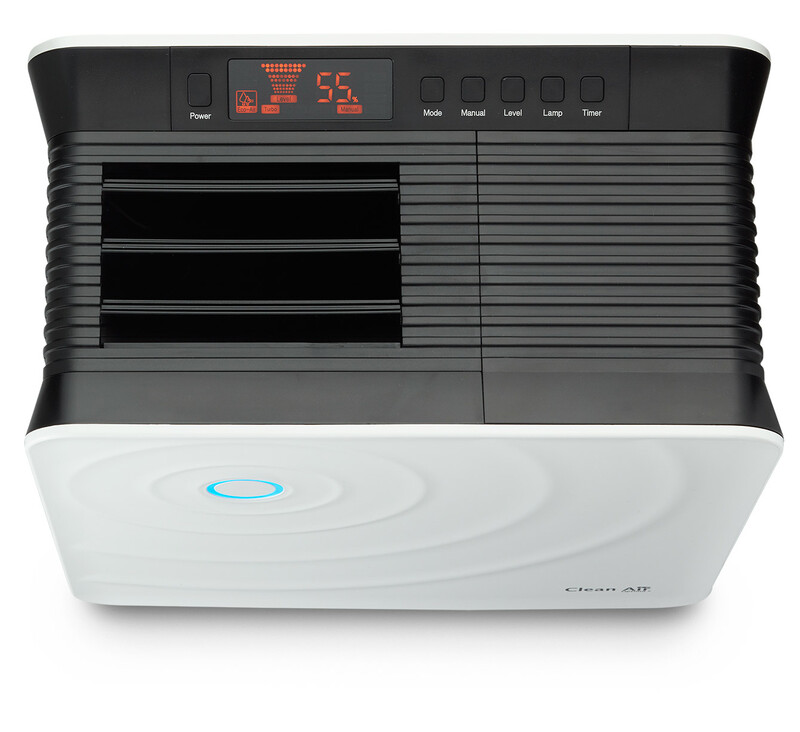 The air washer CA-803 is hence an all-round talent which can be used as air humidifier and air purifier. Relative humidity in living and working areas decreases below the advised 40% especially during heating season. 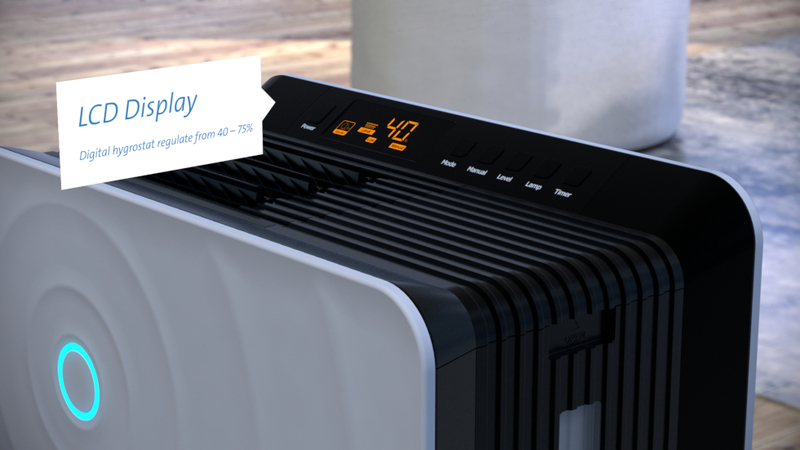 In winter time dry air is especially frequent in rooms which are heated. 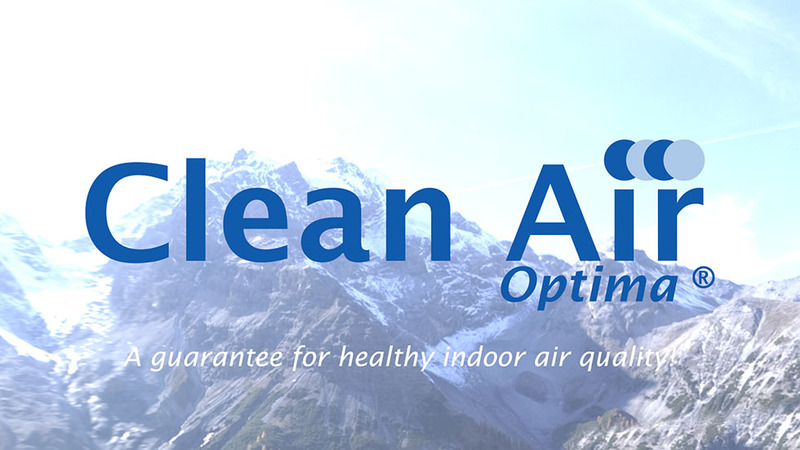 The colder indoor air, the less humidity can be absorbed. The optimal relative air humidity advised by doctors lies around 40 to 60% relative humidity. Human beings experience humidity in this area as agreeable and optimally humidified. The level of humidity is hence ideal for human and animal health and simultaneously protects furniture, wooden floors, music instruments, antiquities, plants and other precious objects from drying out. 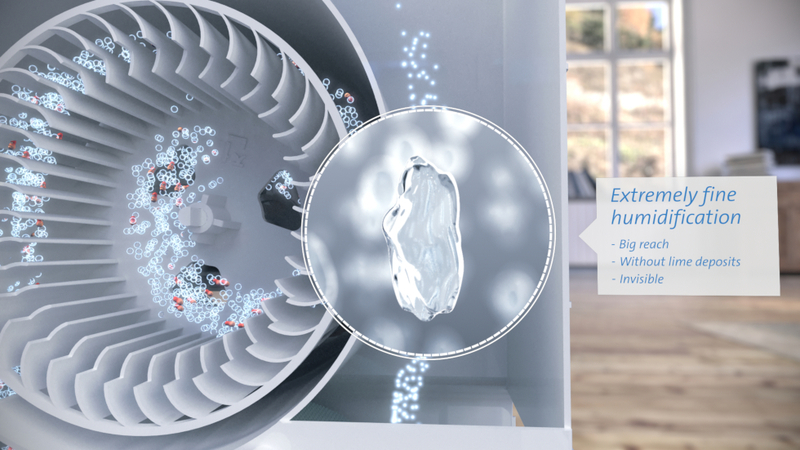 Thanks to the integrated hygrostat, humidity can be controlled at the push of a button for optimal indoor climate. 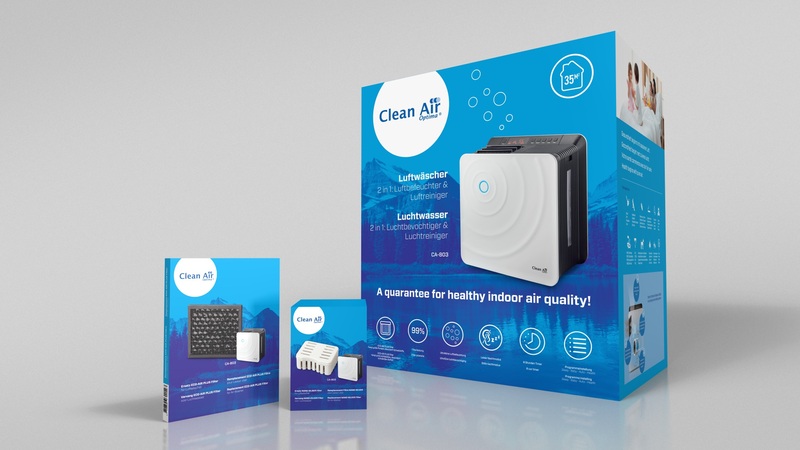 Thanks to two performance levels, day operation and silent night operation modes, as well as the digital display with dimmer, the air washer CA-803 by Clean Air Optima is perfectly suited for the bedroom or children’s rooms. 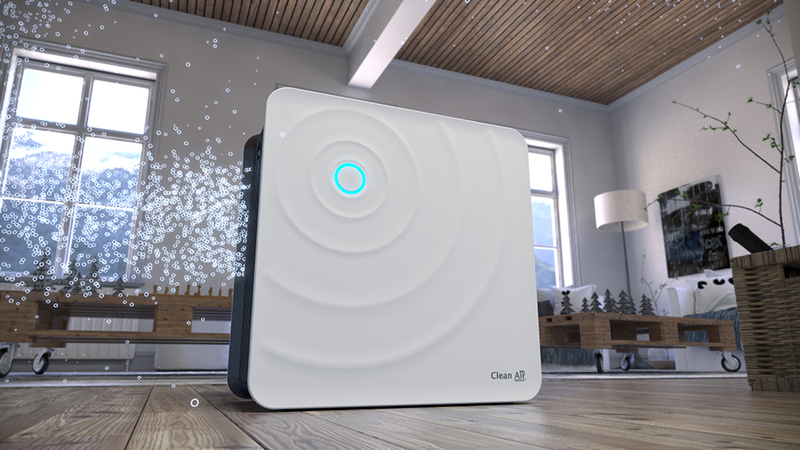 The new air washer CA-803 by Clean Air Optima works with the highly effective humidification principle of cold evaporation! People suffering from allergies and skin problems have less ailments, can sleep better and experience an increased quality of life thanks to optimal humidity and healthy air. 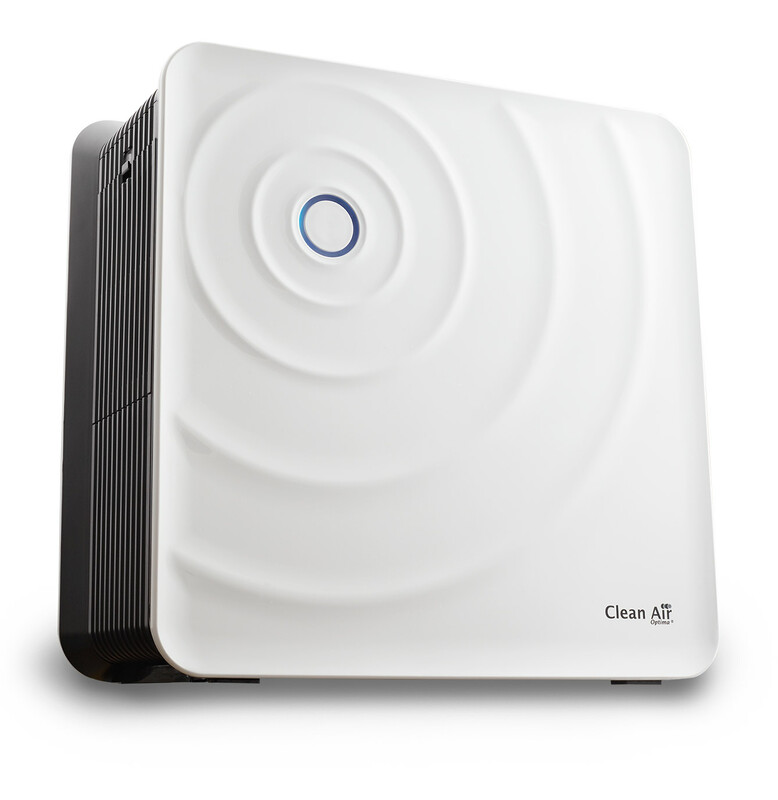 Through a program specially designed for children’s rooms, the air washer CA-803 by Clean Air Optima creates a healthy indoor climate in the children’s room and protects babies and children from dry and itchy skin, cracked lips, sore throats and reduces the risk to develop dust allergies. • Activated carbon prefilter: the prefilter catches particles like lint or hair. 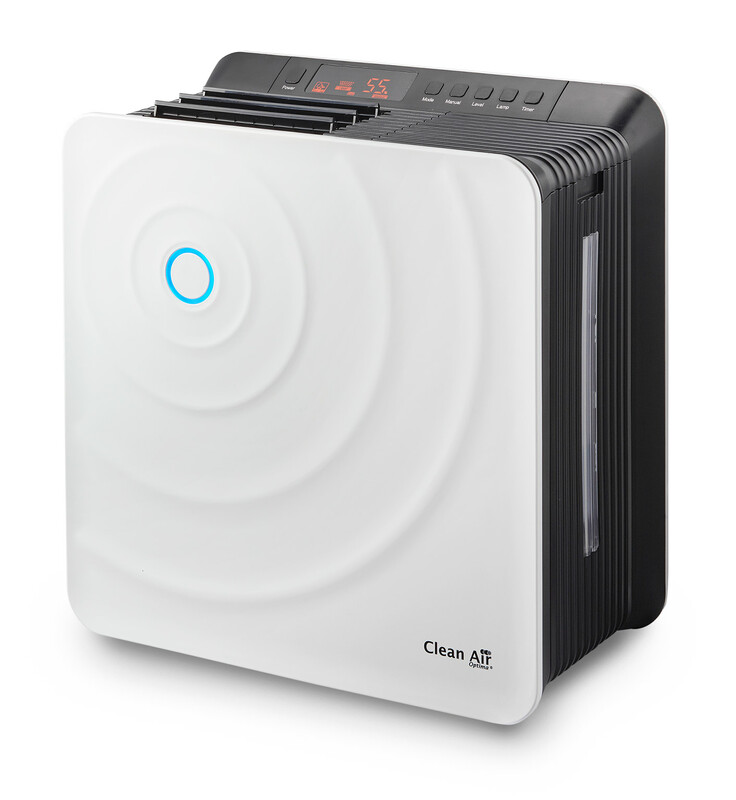 The air washer CA-803 by Clean Air Optima is an all-round talent that can be used simultaneously as an air humidifier and as an air purifier. This highly effective air washing system transforms unclean and dry air into purified and healthy air. It can be use all year long thank to this double function. 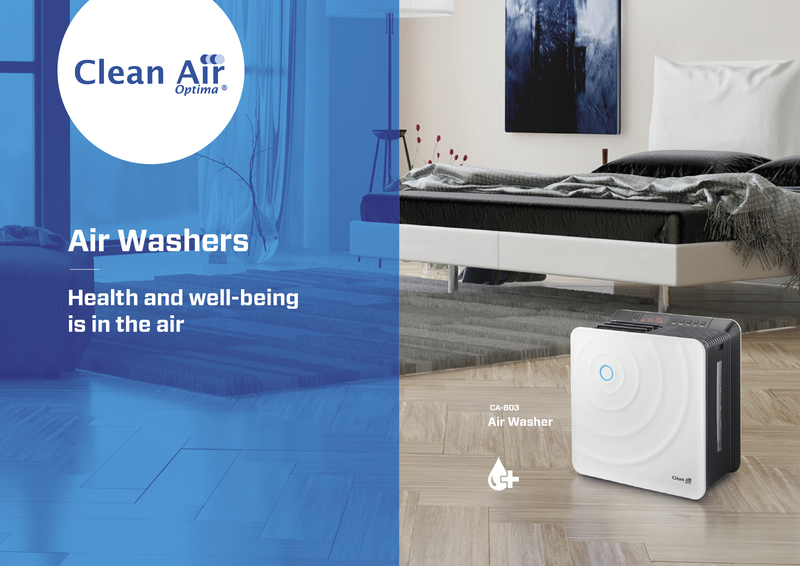 Even persons suffering from allergies can breathe again freely in rooms equipped with this progressive air washer CA-803! 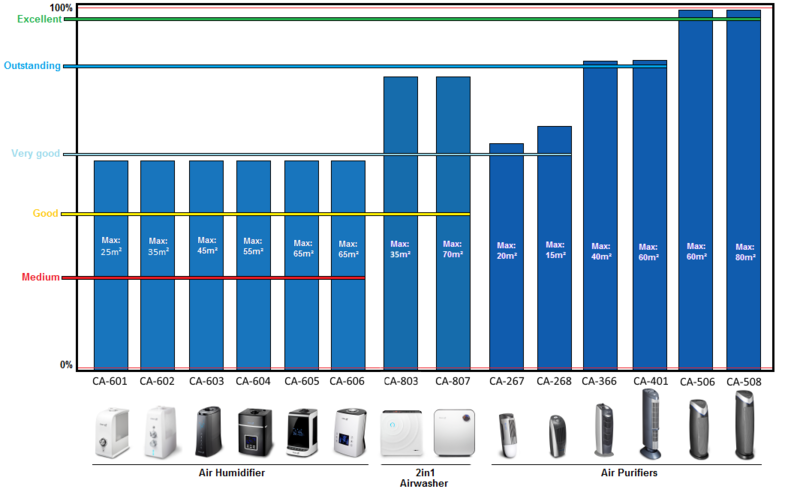 The air washer CA-803 combines four programs to optimize indoor climate with high performance, silent mode, day and night operation. Its “sleep” and “baby” modes are particularly suited for the children’s rooms, the bedroom or other rooms where silence is required. Ideal for rooms up to 35m² / 90m³ / 375ft². The air washer CA-803 by Clean Air Optima® is particularly suited for persons suffering from asthma, bronchitis, hay fever, allergies against dust, animal dust or animal hair or persons with a weak immune system. Its lifestyle design and neutral color, make it possible to place the air washer CA-803 by Clean Air Optima® in each interior: the living room, the bedroom, office, staff rooms, waiting rooms, rooms where people smoke, doctor’s practices or treatment rooms from dentists, physiotherapists, kindergartens, school rooms, retirement homes, sport and fitness centers, hotels, bars, restaurants, spas, cafeterias, stores and public buildings. • No need for chemicals! Every two weeks the left over water should be removed from the tank and the base tray should be cleaned and rinsed. 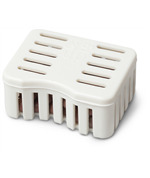 The humidification discs should be regularly cleaned in the dishwasher every 4 weeks. 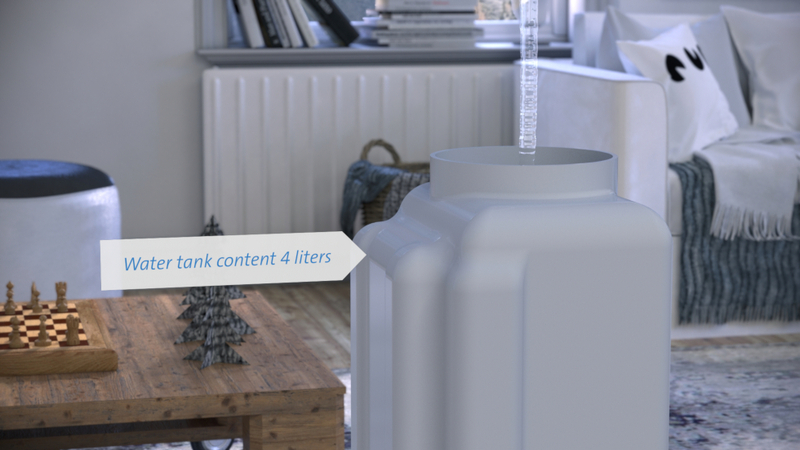 The pads are dishwasher proof up to 40° C.
Shake the water tank filled with water 4-5 times with closed lid. Clean the empty water tank daily by using a cloth to dry the inner walls. Do not add chemicals. 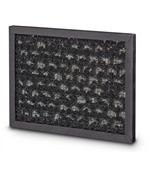 The prefilter catches big dust particles like lint and animal hair. Activated carbon neutralizes smoke, chemicals, gas and smells, prevents the development of bacteria, virus and mold. The ECO-Air Plus / activated carbon prefilter can easily be removed from the lid and be quickly cleaned with the vacuum cleaner or a brush. If the device is working continuously (24 hours a day) under normal circumstances, we advise to clean the filter two times a week. 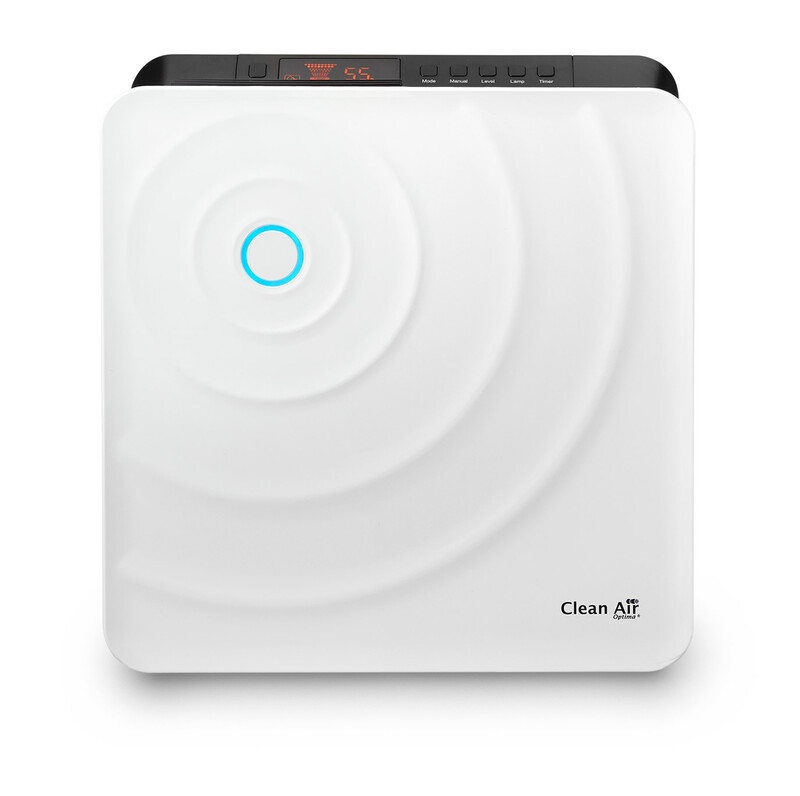 The air washer CA-803 by Clean Air Optima is equipped with an antimicrobial water filter. The filter is made of a cylinder with small plastic balls. The plastic balls are embedded in nano silver in order to suppress the development of germs and smells. The filter can be easily cleaned by rinsing it twice a week with tap water. 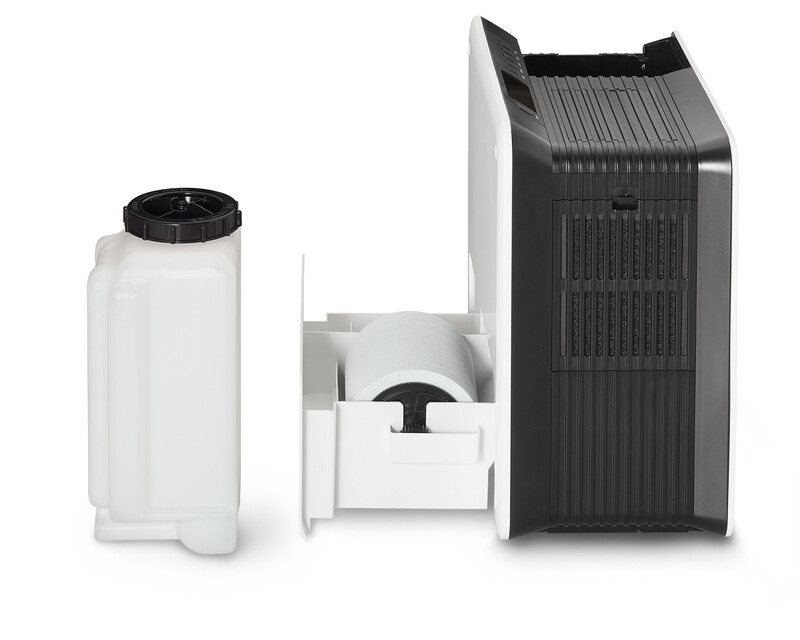 Depending on the use, the activated carbon filter has a life expectancy of approximatively 6 months and the nano silver filter of approximately 12 months. A detailed description regarding maintenance and cleaning can be found in the user manual CA-803. If the device is not used for a longer period of time, it should be thoroughly cleaned and all parts need to be dried well. Super product! Air Washer create ideal comfort in our baby's bed room. Clean air bevalt heel goed merk nu al dat de lucht zuiverder is en ook aangenaam vochtig,fijn dat het bijna geluidloos is wij zijn zeer tevreden . Ik heb lang gezocht, want ik wou graag dat ik mijn houte vloer in goede conditie kon houden en daarnaast ook een goede lucht kwaliteit. En ik heb een grote opp. en heb dus de AC-807 en 803 gekocht deze zien er mooi uit waardoor ze niet zo opvallen in de kamers. Ik heb de units een paar dag al aan het het voelt als je binnen komt een stuk schoner de lucht dat het lekker fris aanvoelt. Ben er blij met het product. Sehr leise und effektiv. CA-803 für 25qm ausreichend. Angenehme Frische im Raum.